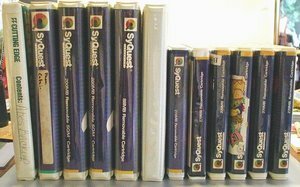 SYQUEST 5.25 IN 88MB - 44MB - 200MB - 3.5 IN 270MB DISKS LOT -Sale & help comments reviews. This item is a lot of SyQuest Magneto-Optical drives / Removable Cartridges. This lot includes 2 units of 88mb 5.25 in cartridges, 2 Units of 44mb 5.25 in, 2 Units of 200mb 5.25 in, and 6 units of 3.5 in 270mb cartridges. These cartridges are used and you may need to reformat them. This lot is being auctioned as-is. NOTICE: This Pre-Owned-Recycled syquest 5.25 in 88mb - 44mb - 200mb - 3.5 in 270mb disks lot was described to the best of our knowledge and it is offered as-is. If the field -Items in Stock- shows zero, the product is no longer available.